Due to the elevated location of this beautiful finca you can enjoy a wonderful view of Pollensa and the Tramuntana. Due to the elevated location of this beautiful finca you can enjoy a wonderful view of Pollensa and the Tramuntana. On the cozy terrace you can enjoy a wonderful barbecue and eat at the massive wooden table outside. This will surely become one of your favorite places and from there you can also look directly at the inviting swimming pool. Next to the house is the annex with 2 bedrooms and a bathroom and the pool you will find an additional, practical garden with shower. The legendary village of Pollensa is within easy walking distance, where you will find many shopping opportunities, great restaurants and cafes.Puerto Pollensa, is easy to reach with the kilometer-long sandy beaches and coastal promenades of this region (about 5 km) and on this way you will also find a turnoff to one of the most beautiful bays of the island - the Cala San Vicente. This villa is made from wood and brick and was originally built in 1980 and refurbished in 2011. The agent has rated it as a three star property so it is a well-kept villa, equipped with standard furniture. It is also good value for money. 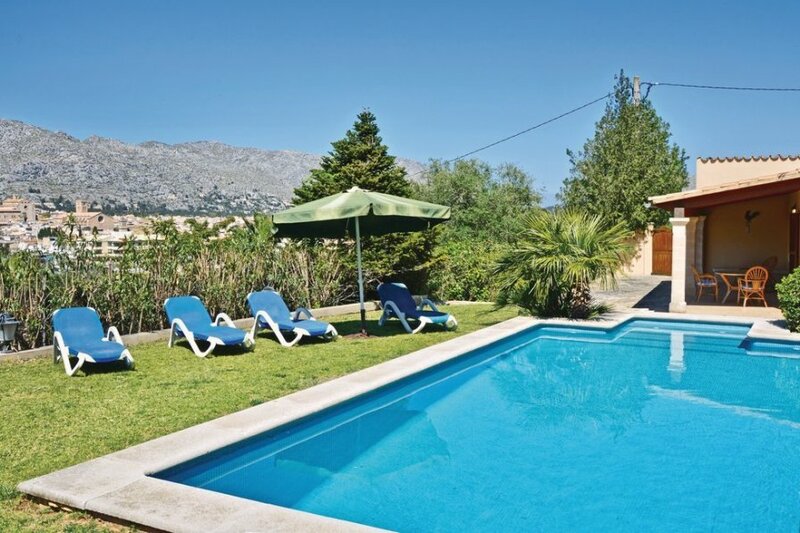 This villa has a swimming pool and mountain view; it is also located in Pollensa, only 8km from Alcudia. The nearest airport is 50km away. It is set in a good location, 4km away from a sandy beach. There's also a restaurant 1km away. The villa is well equipped: it has a refrigerator, microwave and washing machine. It also has a barbecue, a garden and some garden furniture outside.